What is a Cloud CMS? A Cloud CMS is a web content management system that is hosted on a network of web servers and delivers the content to the website or application via the internet. The server that hosts the website or application does not run content management software. The content is stored in a remote server, hosted independently from the website and the content is fed to the website/application host server via a web service (aka an API). 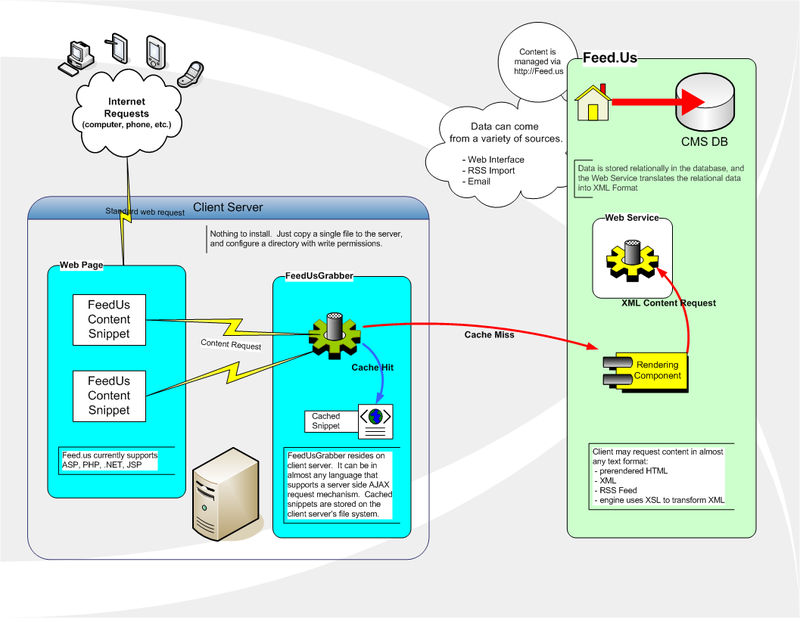 Feed.Us is one of the pioneers of the cloud content management. Content producers use Feed.us to write and publish content. That content is stored on www.Feed.Us and then fed to their website server via our unique Feed.Us "Grabber" technology (or JSON or raw XML). » Separation: Content is stored independently of your site's server. If there's a problem with your web host - your content is stored in a completely separate location. » Speed: Your site does not have to run any special content software and Feed.Us content is fully cached. » Flexibility: You're not married to one system - mix and match different services with ease. » Universal: Works on any server regardless of where your server resides and what it runs... PHP, ASP, .NET, JSP, Rails... There is no platform/language requirement and you can publish content to multiple platforms. » Rackspace: Feed.Us is located within Rackspace's awesome cloud - your content Rackspace's network of servers. » APIs/Web services: we love our "Grabber" web service that is really easy to setup. But Feed.Us can work with a variety of web services, like JSON, to feed your content to your server. » Not just for websites: Feed.Us can work within web and mobile applications. You already have your email and your docs in the cloud. Isn't it time you considered moving your website content into the cloud? Talk to us today and find out how we can help.